Most wireless network routers and access points contain Wi-Fi antennas that radiate signals equally well in all directions. These antennas are called omnidirectional, and they make router setup and placement easy. When the router is installed in the center of a home and wireless clients are distributed throughout the rooms, an omnidirectional antenna directs the signal to all the corners of the house. Sometimes, it is better to replace the router's built-in antenna with a different one. An omnidirectional antenna can have difficulty reaching a long distance because its signaling power expands in all directions. This can result in a "dead spot" in your home or business, where the signal can't reach. Replace the existing omnidirectional antenna with a stronger omnidirectional antenna. Replace the existing omnidirectional antenna with a high-gain directional antenna. Add an external omnidirectional or directional antenna to the router. Check your router manufacturer's website. It may sell enhanced replacement antennas for your specific model router. Even if the manufacturer doesn't carry replacement antennas, plenty of universal antennas are available on the web. Determine your router's networking standard before you buy an antenna. It may be wireless N or wireless AC technology, labeled 802.11n or 802.11ac, or another specification, and you must buy a compatible antenna. Upgrading the antennas on the router doesn't require any tools. Just screw off the old antennas and screw on the replacements. If the router's antennas cannot be screwed off, they probably aren't replaceable. Some router manufacturers sell external omnidirectional and directional antennas that are significantly stronger than the router's built-in antenna. A stronger omnidirectional antenna is more likely to reach faraway locations in the business or home. Because Wi-Fi connections are distance-sensitive, a stronger connection often leads to increased network performance. 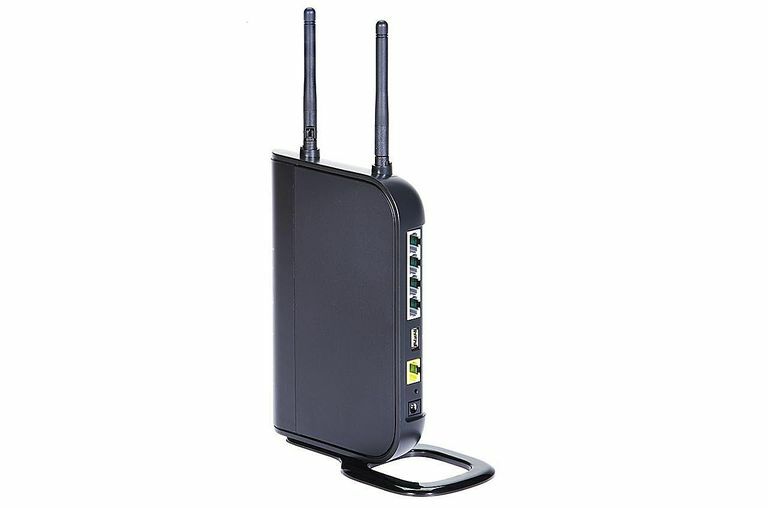 Many routers provide an external antenna jack that allows a simple connection for the new antenna but consult the router product documentation for details before ordering a new antenna. Greater Wi-Fi range can be achieved with a high-gain directional antenna that increases signal receptivity in a particular direction. By focusing the signal, a high-gain antenna allows the signal to be better controlled and literally aimed toward the area of the home where the wireless devices are located. A wireless antenna that is too strong can create network security issues. Use of strong omnidirectional antennas can result in Wi-Fi signals that bleed outside a house into neighboring areas, where the radio signals can be intercepted.